Tråd: Pioneer med ny platespiller? So far we know that it has a USB connection, ethernet connection for X-Link connection (Editor’s Note: This info was incorrect, according to our sources on the ground there’s just Phono Out…) with other Pioneer gear, and analog RCA out. It’s also got a pitch fader that goes +/- 8 and a “pitch reset” button at the side of it along with a “tempo range” button at the top. But it’s pretty clear this is a very early prototype – so almost every feature could be added or removed by the time the final product comes to market. 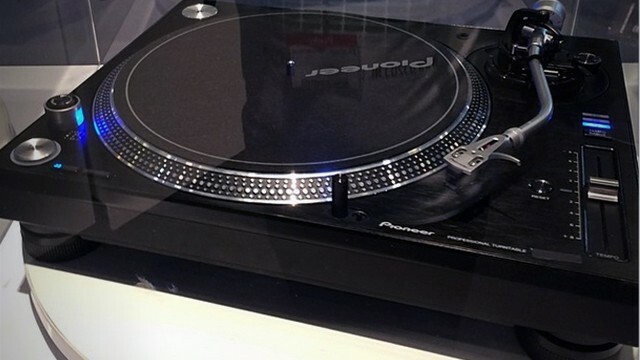 The design is very, very familiar to anyone who knows their way around a Technics 1200. Siste redigert av Aerik; 13.03.2014 kl. 20:08. Noe rart her hvorfor i alle dager skulle Pioneer ha en Technics kopi ? , ( er det blåruss som slår til igjen ) de har da byggetegninger selv på noe av det beste som fantes av platespiller . SL1200 har nesten evigt liv som OEM produkt. Forøverig så regner jeg de har en avtale med Technic her, ellers så blir det vel advokatmat pga ©® . Men som sagt, så ser det jo ut som en blåkopi av Technics sin serie.